Being, as we say in DC, "originally" from Michigan, just outside Detroit nonetheless, I have a soft spot in my heart for Mitch Albom. He has not let me down before with his amazing Tuesdays with Morrie or The Five People You Meet in Heaven. Have you read either one of these yet? If not, you should. Recently, my buddy Mitch, released a new treat, The Time Keeper. We check the time, we follow time, we keep time, or does time keep us? The story is told in his typical writing style - clean, simple, and easy to read. If you haven't already, I'd recommend grabbing a copy soon, because I have a feeling that Hollywood is going to try to get this one up on the big screen. 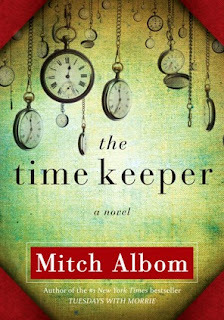 As a side note, I highly recommend this book to my spin instructor, who is constantly telling me to stop keeping time by counting down the clock and to try to live in the moment. During spinning, really?